I hate to be the bearer of bad tidings, but the Colts do not match up well with the wildly inconsistent Oakland Raiders. The main thing that concerns me is their defense and their bump and run man to man coverage schemes. Generally Oakland plays very simple defenses that reflect the style that Al Davis coached back in the 1960's. The cornerbacks are up in the receiver's faces and the strong safety is up closer to the line. The free safety is back in a single high coverage. It is critical against this sort of defense for your wide receivers to be able to beat the bump at the snap and to get separation. Often the timing of the pass play can be severely disrupted if the receivers cannot get free quickly. 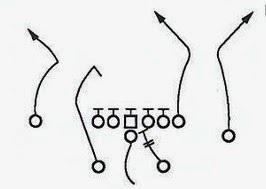 If a good quarterback has time to let the play develop, big plays can be there. But we have not had a single game this season where we have been able to provide Manning a clean pocket throughout the game. Expect our offensive line to have a lot of trouble against Oakland's big and talented front four. I don't expect us to be able to run the ball at all - despite our improvement against Jacksonville. The critical player this week is Pierre Garcon. He has shown in the past that he is capable of winning one on one physical match ups and he is our most explosive receiver. Reggie Wayne will have Nnamdi Asomugha in his face all day and may be taken out of the game. Blair White will be at a disadvantage with his relatively small frame - look for him to be roughed up a bit in the slot. The match-up for us on defense is not much better. The Raiders feature a power running game with a play action passing game feeding off of that. Our front seven will be tested all game by tackle to tackle runs. I feel that the Colts only hope in this game is getting ahead early, forcing the Raiders to pass the ball. This could be a ugly and depressing game. Nothing more fun than getting down on our boys before they even start playing. I'd think you'd put in the article about matchup problems that the Colts will give the Raiders, but it's just easier to talk about how bad our team is and how they really don't have a chance. Great article. oh yeah, i hate to admit that some the stuff you wrote about Colts receivers is awfully true. I am GLAD to mention it to you that what you are missing to explain is COLTS (who have everything to lose depends on a W in this game) and Raiders (who have nothing to lose or gain from this game). I hate the fact that people who compare teams playing against each other try to match them up man to man and what they miss to compare are the scenarios of playoff implications . Actually, the Raiders are playing for a division title still. They need help but have to win, just like the colts. I will be at the coliseum watching my beloved RAIDERS knock Peyton from the playoffs. ESPN seems to bring the rowdy types in... oh well. The Colts O-line has allowed the fewest number of sacks in the NFL so far this season, and you claim that Manning hasn't had "a clean pocket any game this year"? What are you smoking? Clear the air -- and your mind -- watch the games and read the stats! Your credibility as a legitimate analyst is undermined by such ludicrous claims. Manning doesn't take sacks - no matter how much pressure he is getting. Sacks are not a good measure of the pressure he has been getting this year. Not a good assessment at all. You are completely over-selling how good Oakland's pass defense is. Oakland is one of the WORST in pass defense despite their 5th overall ranking and 40 sacks. The yards allowed is due to the Raiders leading the NFL in fewest passes attempted against their defense. In addition to that, the Raiders are 26th overall in yards per pass attempt at 7.4 yards. Did you know Manning is averaging 43.4 attempts per game? Not a good recipe for the Raiders. Gets worse. The Raiders allow the 7th highest passer rating to opposing quarterbacks, which has a lot to do with their inability to get interceptions (2nd to last in NFL with 8). Oakland doesn't boast a great run defense, either, at 130.9 yards allowed per game. The Colts might be finding their stride on the ground, even a 70-yard day would be a success for Indy. Last but not least, the only teams the Raiders have beaten outside of their own division were the Rams and the Seahawks, both NFL bottom-feeders. The Raiders impressively are 5-0 in their own division, but are unsurprisingly 0-3 against the AFC South Division. Raiders do not match up well with the Colts! Gonna be a double digit victory by Indy with ease and you'll be sorry you wrote that... poor analysis. I love how people cite statistics as if they are important and then explain why they don't mean anything. I do not refer to or care about statistics and they have no bearing on anything I write. I hope I am wrong and the Colts win easily. But this blog is for MY thoughts and opinions - and my opinion is that they are heading for trouble. I explained exactly why, anything I did not address was because either it is completely obvious or is not going to be a factor.